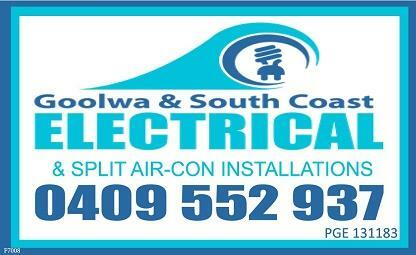 Goolwa & South Coast Electrical are your local electricians offering a 24-hour, 7-day service throughout the Fleurieu Peninsula. Whether your electrical needs are domestic, commercial, industrial or rural, Kingsley Vincent from Goolwa & South Coast Electrical is on hand to help. The business offers assistance for both new projects as well as maintenance and repairs to existing buildings. For great electrical service from an experience professional contact Kingsley Vincent of Goolwa and South Coast Electrical today on 0409 552 937. The business services Goolwa, Victor Harbor, Port Elliot, Middleton, Yankalilla, Mount Compass, Strathalbyn, Myponga and all points in between.